The first half of this course provides a focus on Old Icelandic grammar, and the second half allows students to begin reading from a selection of Old Icelandic prose and poetic texts. Old Norse is a term used broadly to refer to languages and dialects of Viking Age and Medieval Scandinavia, and sometimes more specifically to refer to Old Icelandic, the form of the language used in Medieval Iceland. It was in Old Icelandic that largest pre-modern Scandinavian literature was written, including the prose sagas and a wealth of mythological and legendary poetry. This course begins with a focus on Old Icelandic grammar, with the immediate aim of helping students develop basic reading abilities in the language, though also highlighting connections to other Germanic languages as a gateway to Germanic philology. In the second half of the course, students start to use this linguistic and grammatical knowledge to begin reading from a selection of Old Icelandic prose and poetic texts, as well as, in conclusion, to look beyond Old Icelandic to selected Viking Age runic texts. There will be 2 one-hour prerecorded lectures per week, with two weekly discussion sessions as assigned. 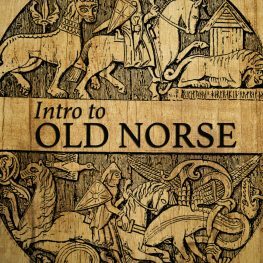 A New Introduction to Old Norse, Part I: Grammar: Chapter 1 (“Introduction”). A New Introduction to Old Norse, Part I: Grammar: Section 3.2–3.2.1. A New Introduction to Old Norse, Part I: Grammar: Section 3.1. A New Introduction to Old Norse, Part I: Grammar: Sections 3.2.2–3.2.6 & 3.7. A New Introduction to Old Norse, Part I: Grammar: Sections 3.3 & 3.4. A New Introduction to Old Norse, Part I: Grammar: Sections 3.5 & 3.6. A New Introduction to Old Norse, Part I: Grammar, sections 3.7, 3.8, & 3.9. A New Introduction to Old Norse, Part II: Reader: Hrólfs saga kraka, Chapter 23 (“Bǫðvars þáttr), lines 1-40. A New Introduction to Old Norse, Part II: Reader: “Auðunar þáttr”, lines 1-41. Böglunga sögur (ed. Jónsson): Chapter 20, “Frá smið ok Óðni”. A New Introduction to Old Norse, Part II: Reader: Njáls saga: “The Burning of Njáll”, lines 107-192. The Saga of King Heidrek the Wise (ed. Tolkien, C.): “The Waking of Angantýr” (aka Herverarkviða), pp. 12-15 (inc. verses 18-27). A New Introduction to Old Norse, Part II: Reader: Runic inscriptions: Kälvesten, Jelling II, Gripsholm. All required texts will be provided in class. Optionally, you can purchase printed copies of A New Introduction to Old Norse from Amazon (US & UK), amongst other sources.